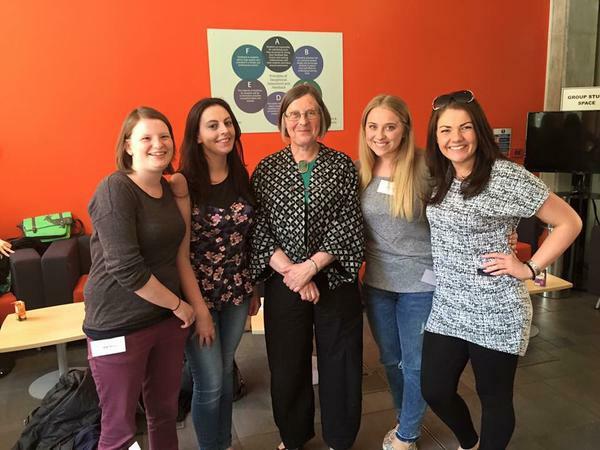 With the sunny backdrop of York, Myself and 3 others from my course attended the BAOT Northern & Yorkshire student conference. Having just completed PP2 and getting ready to go back into classes for the last couple of months of my first year, the conference gave me ample opportunities to be inspired and expand my understanding of a few areas of the occupational therapy profession and how it is ever-changing not just in it's history but as we look to the future. Jennifer Creek - Opening Plenary 'Occupational Therapy in 21st Century"
It was really exciting to hear Jennifer Creek speak at conference having spent a huge part of my degree so far with my head in her textbook. 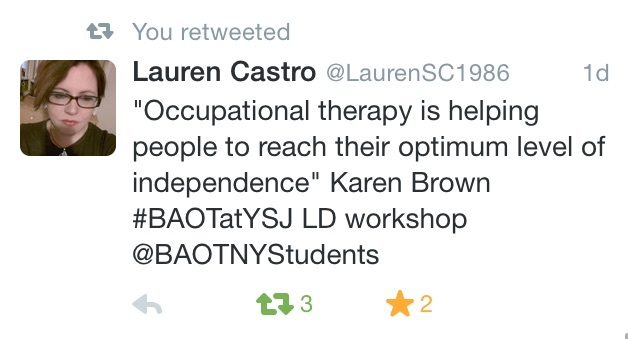 She gave such a great opening plenary that inspired me and cemented my decision to become an occupational therapist. 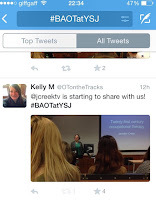 She shared her thoughts on the core skills that occupational therapists use and our uniqueness as a profession. I couldn't help but think back to my Intro to OT assignment and wished that I had been able to hear her speak before I had submitted it as It felt somewhat relevant. 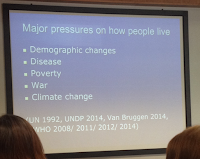 My takeaway thoughts from her opening plenary were the ever adapting scope of our profession and how as OT's we need to be willing to recognise our core skills and adapt to new areas of practice if we want to continue to help people access their occupations as the impact of challenges affect mankind. Occupational Therapy really is an exciting profession to be training to enter, the client mix and career scope really is limitless, as long as there are people with occupations then we have a role to help people engage with them. The conference had five workshop sessions to choose from and three available session slots. All the sessions focused on the conference brief of projecting the future of OT. I chose three to attend although I really would have liked to have gone to all five. I will discuss briefly about the sessions I attended, but the twitter feed has tweets from all the sessions for it's worth checking out. 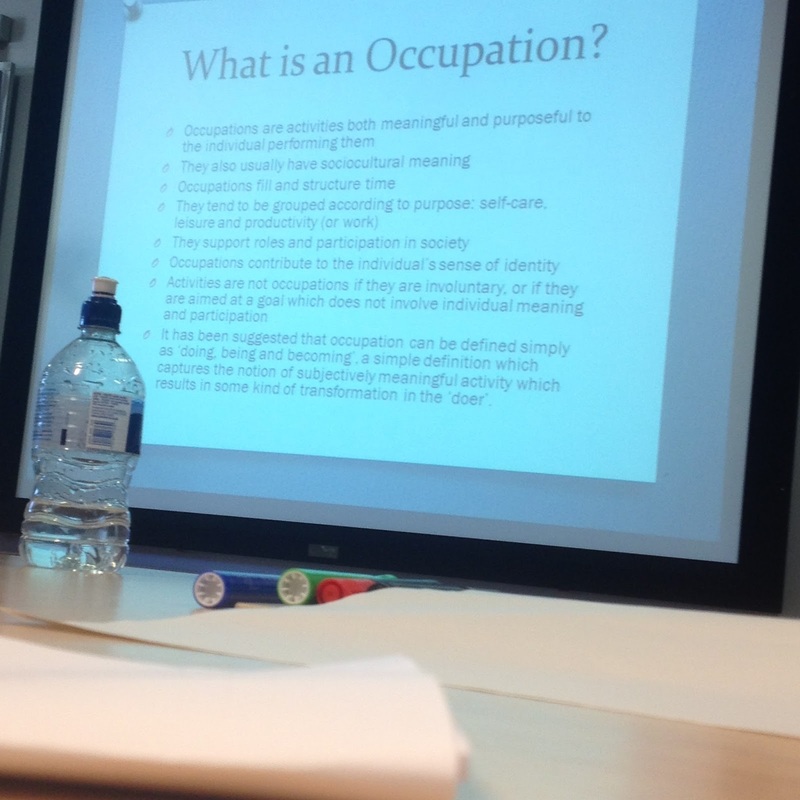 This session began by focusing on what we perceive to be occupations and how we would define them. It also gave us the opportunity to discuss in groups the role of OT by focusing on what our superhero OT would look like. 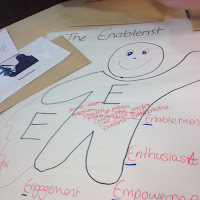 Our group created 'The Enablerist" previously 'The Enabler' (the group at the next table stole our name!). We felt that our powers would be enabling, empowering, enthusiasm, engagement and other E related skills! On the serious side though we acknowledged as OTs we spend a great deal of our time with patients enabling and encouraging them to access their meaningful activities i.e. their occupations. 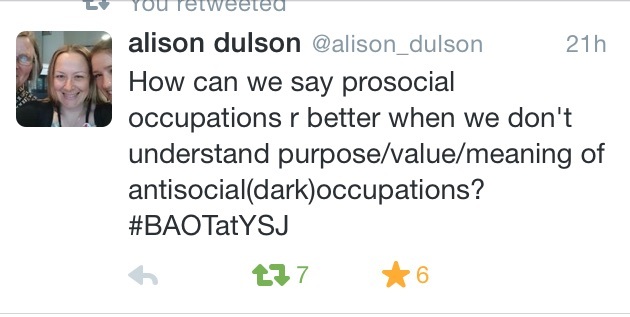 It begs the question what do we do when the clients occupations are detrimental aka 'dark occupations'? Our group then discussed terrorism as an occupation which is something we may come into contact with in some form or another with our clients as an OT. 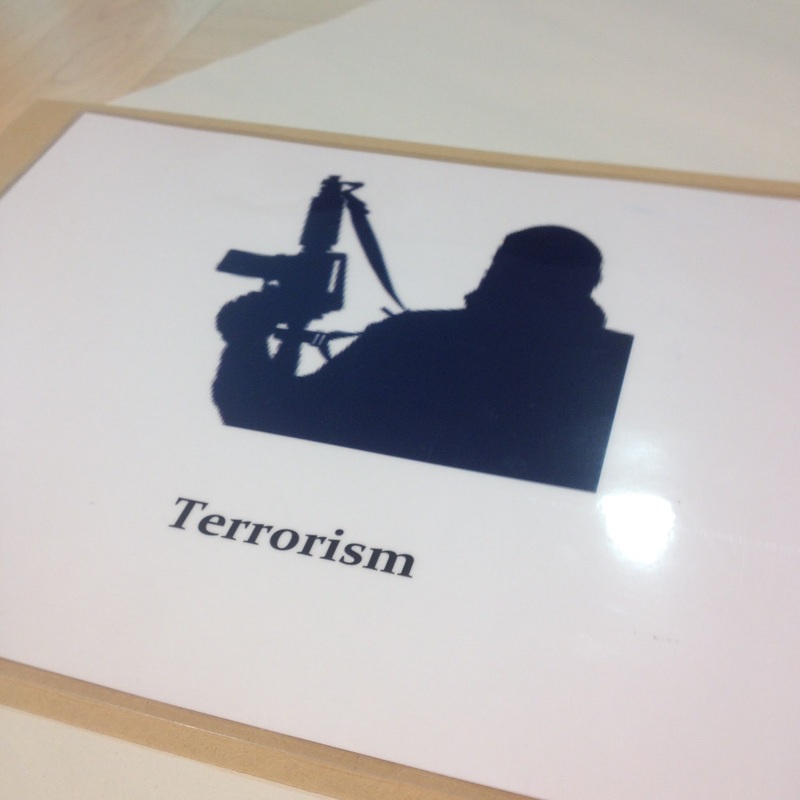 As our group discussed terrorism it became clear it did fit into the definition of occupation we had previously discussed during the session. 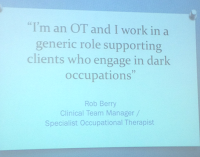 As OTs we can not encourage dark occupations, there is no question about that, but we do have to begin to understand them if we are to be truly client centred in our practice. It also highlighted the importance of supervision, peer support and the use of evidence based practice to guide what we do with clients engaging in dark occupations to make sure what we are doing is meeting our code of ethics as practitioners. This session also dealt with the prospect that we may end up in generic roles if we choose to work in mental health as OTs. 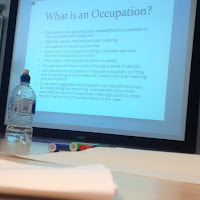 It is a strange concept to think that after studying to be an OT that we'd be in a role that doesn't have occupational therapist in the title. But as we look at the future of our profession it is probably something that will be come even more commonplace than it is now. I was thankful that as I read the job description for a generic mental health role that nurses/social workers I could see that it includes areas that would and do utilise our unique OT skills and also placed importance on your ability to maintain your professional registration and development whilst working under the code of ethics. This session included discussion about what a learning disability is and the issues someone suffering from them may experience. It also introduced us to Lego Therapy. It was really interesting to hear about collaborative working with the SLT that she had done but also to understand our unique perspective as OTs to understand activities in a different and therapeutic way when using them to help achieve goals with a individual. We got to have a go in our groups which helped us understand the skills and components of the activity which was fun if not slightly frustrating for our group as we struggled to make ours! We were told we had the hardest one but it does beg the question how many MSc OT students does it take to make a Lego model of a dinosaur? 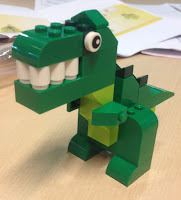 It was really positive to hear how it had been used in practice and the type of models clients Karen Brown had worked with had made and did help to give an increased understanding of Lego Therapy's use in clients in Learning Disabilities Services. 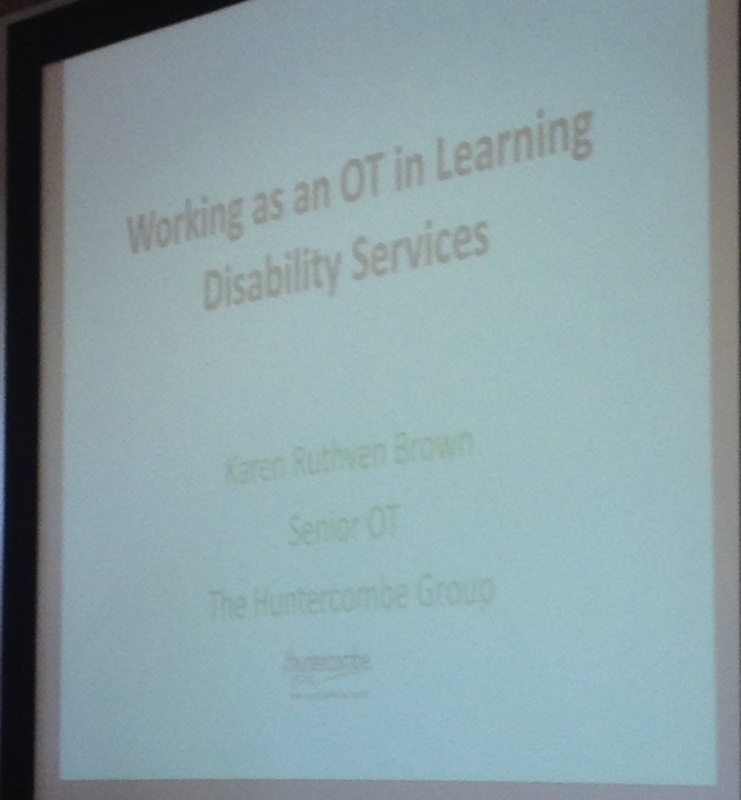 This session also encouraged us to look further than the NHS for roles as OTs and consider a role within Learning Disabilities. 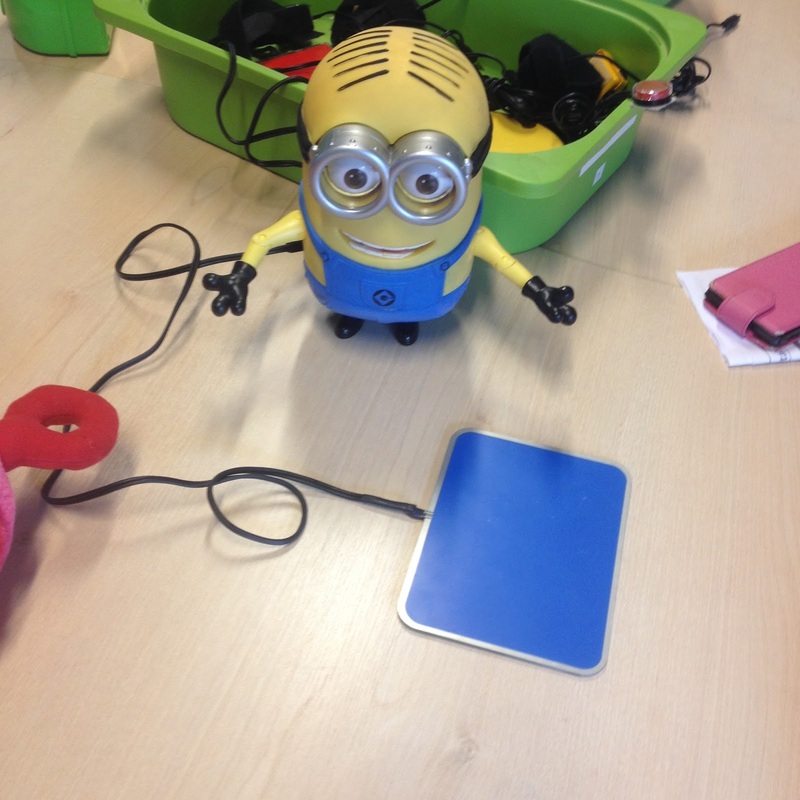 This was a really informative session led by Paula Spencer, and team from William Merritt DLC allowing us to have a go at some of the the technology available using switches. 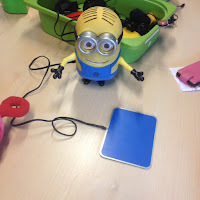 We got to see toys, adapted phones and video games all using the switch technology to allow individuals with limited movement access the activities that are important to them in the day to day life. I was really interested to hear about the role of the switch technology with apple smart phones and the part the technology sector could plan in helping individuals with disabilities to do the things they love and intern increase there social activities. This session also gave me an opportunity to learn more about adaptions to help people with disabilities drive and intro increase their independence. 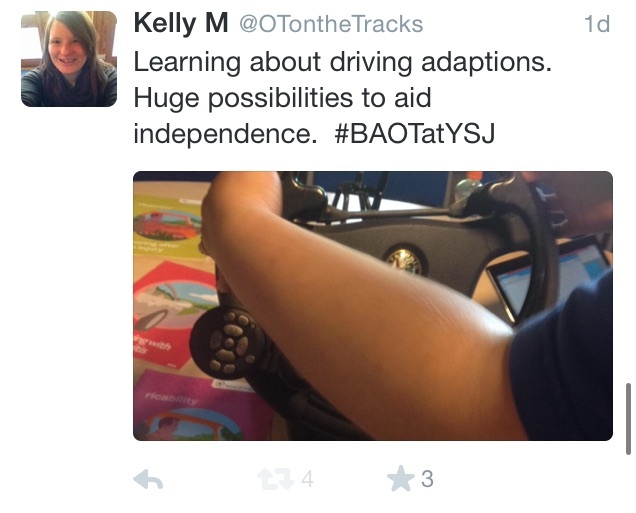 Having come across people who would need adaptions to enable them to continue or learn to drive over the past few years, It was good to hear about the role of the OT in recommending the possible adaptions. It gave me a chance to get a few answers about the length of time until that are re assessed and how that decision is made too, which was really helpful. Katrina Bannigan closed the conference by sharing about the IHC Plymouth Case Study Research Project. 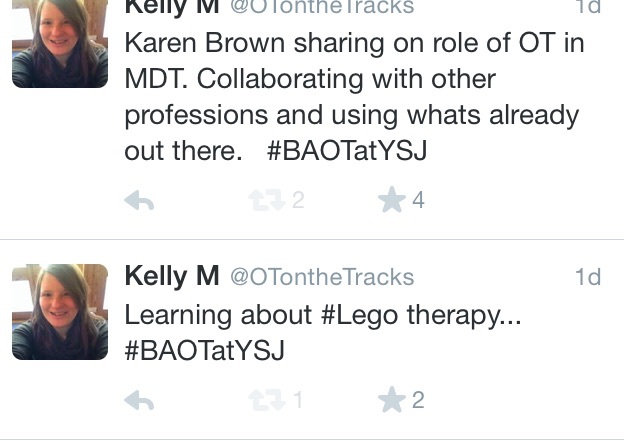 I have been around during an #OTalk about it earlier in the year but was still struggling to grasp the idea if I'm honest so it was good to hear about the project. Great example of technology being used at the conference as well as she video called in to give they closing plenary. 8 weeks apart so lots to catch up on before going back to uni on Monday. 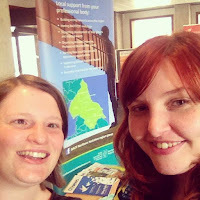 Its always nice to meet people from twitter in person, and even managed to get a selfie with Rachel. Need I say more... photo with the women behind the textbook! Selfie donations went towards #creek600 to help send an African OT or student to the 2015 WFOT regional conference in Uganda. 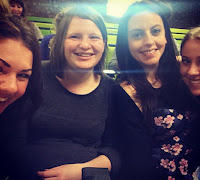 All in all I left the conference ready to tackle the end of first year and excited about the future of the profession i have chosen to enter. It has given me food for thought and insight in areas I may not have previously considered to work which can only be a positive thing. York St John OT Society and BAOT Northern and Yorkshire Region Students did a fab job at organising this conference and I'm really thankful to have had the chance to attend it as an OT student. 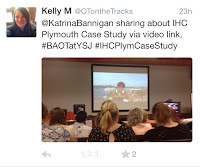 Bannigan, K (2015) IHC Plymouth Case Study Research Project [Closing Plenary] 6th Annual BAOT N&Y Student Conference. York St Johns University. 5th June. BAOT NY Students. (2015) 5 June. 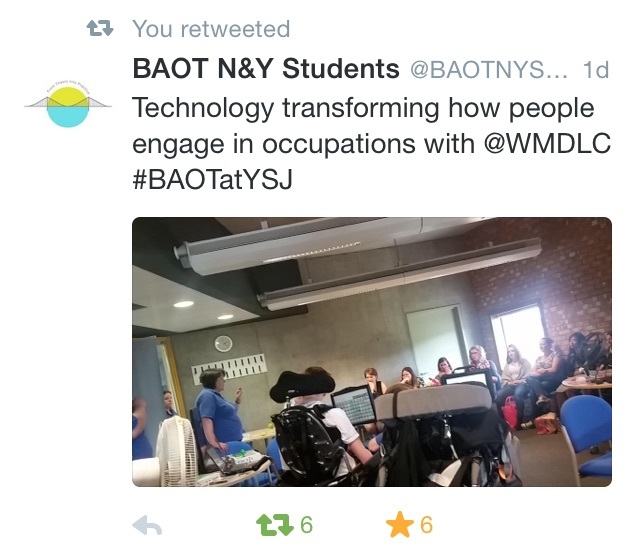 available at: https://twitter.com/BAOTNYStudents (Accessed 6 June 2015). 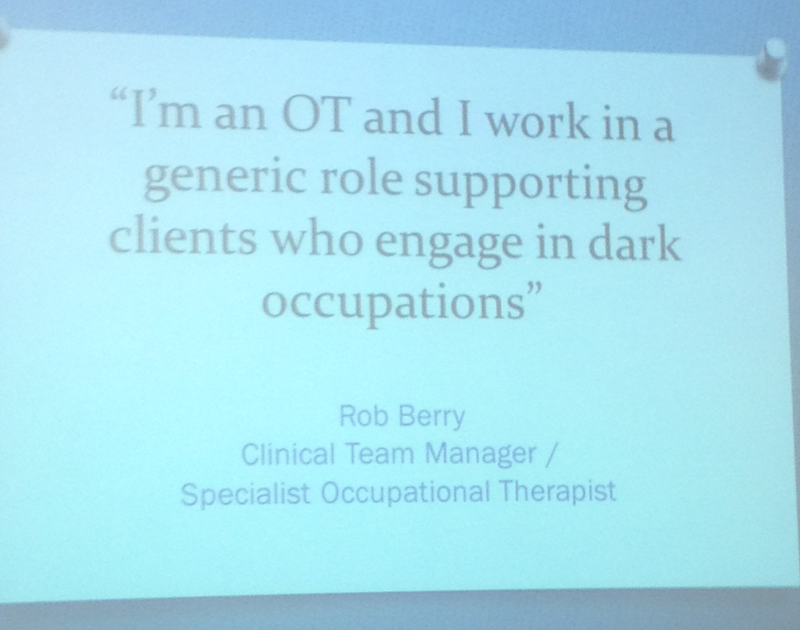 Berry, R. (2015) I am an OT and I work generically with clients engaged in dark occupations [Workshop to BAOT N&Y Student Conference], A. York St Johns University]. 5 June. 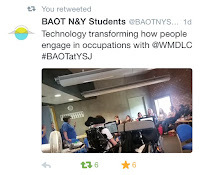 Brown K. (2015) I am an OT and I work in Learning Disabilities Services [Workshop to BAOT N&Y Student Conference], A. York St Johns University]. 5 June. 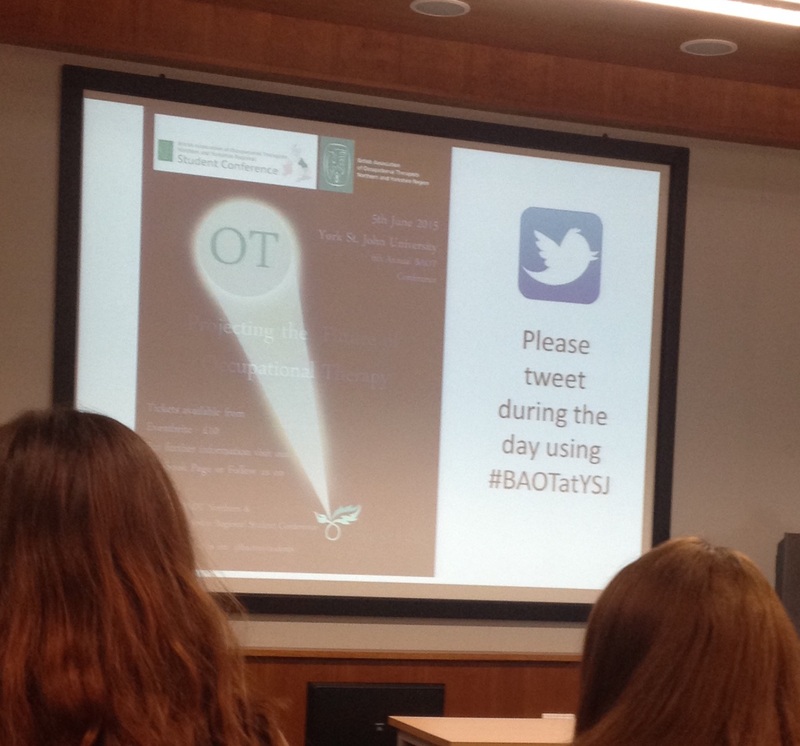 Spencer P. (2015) I am an OT and I utilise technology in interventions [Workshop to BAOT N&Y Student Conference], A. York St Johns University]. 5 June. Creek, J (2015) Occupational Therapy in 21st Century [Opening Plenary] 6th Annual BAOT N&Y Student Conference. York St Johns University. 5th June. 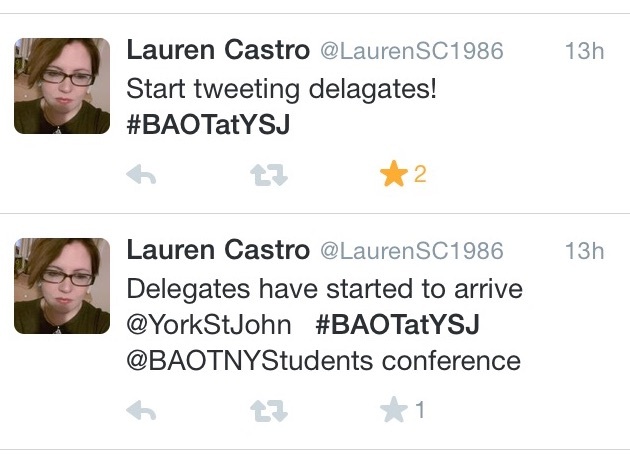 It sounds like a you had a great time at the conference! The student sessions you attended were all very thought-provoking, especially the one about "dark occupations." I'm interested in knowing what you came away from the session with -- as in, what should one do when confronted with a client who engages in potentially harmful occupations?